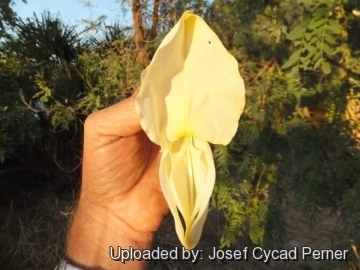 Accepted Scientific Name: Sesbania formosa (F.Muell.) N.T.Burb. Origin and Habitat: Sesbania formosa is endemic to Australia, occurs in the Pilbara and Kimberley areas of Western Australia and eastwards to Arnhem Land in the Northern Territory. There is a small isolated occurrence on Cape York Peninsula, Queensland. The latitudinal range is 13-23° S.
Altitudinal range: From sea level to 550 metres above sea level. Habitat and ecology: Grows in rain forest and similar closed forests or swampy sites particularly on on alluvial plains where the soils range from deep sands to heavy, black, alkaline clays. The area is frost-free. The mean annual rainfall is 230-1570 mm with a strong summer maximum. This species tolerates saline and waterlogged conditions. It is a component of open-woodland, open-forest or closed-forest, commonly associated with Eucalyptus camaldulensis, Melaleuca leucadendra, Pandanus aquatica and Terminalia platyphylla. 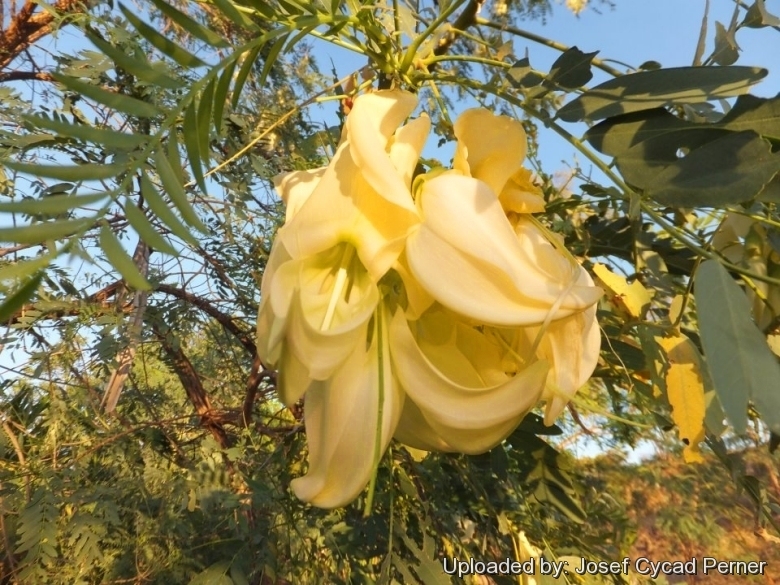 Description: Sesbania formosa is a very fast-growing, nitrogen-fixing, small tree, usually 2.5-13 m tall but sometimes to 20 metres, with large white-cream pea-shaped flowers, usually in pairs in winter. Derivation of specific name: The species name is from the Latin formosus = beautiful, referring to the flowers, which are the largest of any in the Australian pea family. Stem: Trunk more or less erect with few, more or less upright branches. Bark pale grey and, furrowed and corky. Young twigs are finely hairy. .
Leaves: Pinnate, 15-40 cm long with 5-20 or more pairs of leaflets. Petiole and compound leaf axis grooved or channelled on the upper surface. Leaflet blades about 20-30 mm long, 5-11 mm wide, aristate at the apex. Stipules triangular, about 7-8 mm long, broad at the base but tapering to a point at the apex. Filiform stipels present at the base of the leaflet stalks. Inflorescences: Shorter than the leaves 2-7-flowered. Flowers: Large, pea-shaped, white or yellowish-white, 7-12 cm long. Calyx about 20-25 mm long, lobes about 5 mm long. Petals variable, distinctly clawed, larger petals about 90-100 mm long. Stamens 10, the filaments of nine stamens fused to form a tube open on one side, one stamen free. Ovary glabrous, stalked, containing numerous ovules. Fruit: Pods linear, narrow and curved, pendulous, terete-compressed, septate between the seeds, pods about 20-60 cm long, 7-9 mm wide and pointed at both ends. Seeds: Numerous, bean-like, smooth, shining and dark brown about 15-50, transverse, about 6-7 mm long, flattened but turgid. Phenology: Flowering is in May-June and the pods mature August - September. Seedlings: Cotyledons obovate, about 18-20 mm long. At the tenth leaf stage: leaflet blades oblong or obovate, glabrous, apex obtuse or mucronate, base cuneate; petiole and rhachis of compound leaf glabrous; stipules narrowly linear-triangular. 1) “Species information: Sesbania formosa” Australian Tropical Rainforest Plants <<http://keys.trin.org.au/key-server/data/0e0f0504-0103-430d-8004-060d07080d04/media/Html/taxon/Sesbania_formosa.htm>> Web. 13 Sep. 2015. 3) Brock, J. “Native plants of northern Australia.” Reed New Holland, Sydney. 2001. 4) Burbidge, N.T. 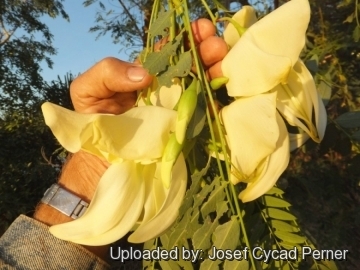 “The Australian species of Sesbania Scopoli (Leguminosae).” Australian Journal of Botany 3: 103-141. 1965. 5) Doran, J.C. and Turnbull, J.W. (eds.) “Australian trees and shrubs; species for land rehabilitation and farm planting in the tropics”. ACIAR Monograph no. 24. Australian Centre for International Agricultural Research, Canberra. 384p.1997. 6) Petheram, R.J. and Kok, B. “Plants of the Kimberley region of Western Australia. University of Western Australia Press”, Nedlands, Western Australia. 1983. 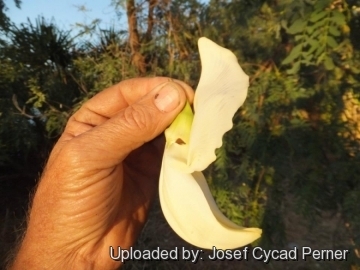 Cultivation and Propagation: Sesbania formosa is a very fast-growing tree raised easily from seed. It grows is adapted to moist sites in the hot arid to humid tropics, and tolerant of alkaline, saline and waterlogged conditions. It is suited to greenhouse culture but does well out of doors in tropical and mild Mediterranean climates. It is an excellent species for shade, shelter, as a live fence and for erosion control. It has the potential to become a weed under certain conditions. Traditional uses: The leaves & flowers are edible; the leaves are steamed, boiled or sautéed as a vegetable in many places, including India & Indonesia. The flowers can be eaten raw or cooked. Australian Aboriginals used an infusion from the inner bark for treating sores and general illness. The wood is white, soft, light and non-durable and is little used. Propagation: Propagate usually from seed that are very easy to germinate. There are about 31 000 viable seeds per kilogram. Seeds need up to 1 month to germinate. Minimum 30°C. Maximum 42°C. Before sowing put the seeds in hot boiling water and the seed starts to peel, don't worry and put them in pots they will start germinating in the following week, just ensure that they grow straight, they have the tendency to fall down. Browsers are used to protect the young seedlings.